Does NOT require any DLC. A few optional files and more screenshots are available on Nexus. Black Dyed Leather is crafted by combining Leather and Frostbite Venom at the forge. To make Dark Botherhood Items, you must first get the recipe from thier sanctuary. If you cant find it, look at the spoiler on the bottom of description. If you wish to uninstall the mod, make sure to unequip the items first. Otherwise you will still have the permament effect on your character. v1.2 - Changed the enchantment school to ''NONE'' to hopefully prevent it from conflicting with other mods (also counts as vampire-hotfix). For version history for earlier versions, please visit mod's Nexus page. This is a small list of mods that use some of the special slots, and do NOT conflict with this one for sure. 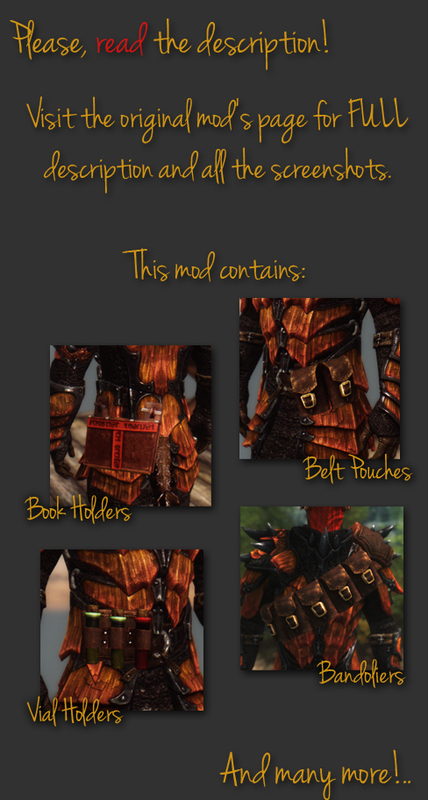 Thanks to AlphaWoIF for his permission for using some Witcher2 models he optimized. Thanks to BrokeFoot, TuCoT and Namaste911 for their amazing screenshots. The recipe is on the bookshelf in the first room of Falkreath Sanctuary. Do these bandoliers count as light armor? Im only asking because Im playign a pure mage, and I cant tell if its slowing down mana regen or not, despite having 0 armor rating. If for some reason it is not in the Falk sanctuary, you will have to use the console to spawn it in. Gotta use the "help" command to find the itemID though. so what does one do if it isnt in the sanctuary? is there a way to spawn it in? or do i just have to get lucky and find it elsewhere? What mods do you use to make your game look like in the screenshots? Excellent mod! Works great, looks good, lore-friendly and helps character outfits be a bit more individual. Is there any way to get a bandolier over the right shoulder so that the pauldron for studded armor still shows? Do belt pouches replace box pouches? I made all of them and realized that some of them replace others, so what is the maximum extra storage space you can get? Now I can live out my dream as a Rob Liefeld reject!